The limit in Scotland was lowered to 50mg/100ml blood in December 2014, but currently England, Wales and Northern Ireland remain at 80mg/100ml blood. For commercial vehicle drivers a zero tolerance limit of 20mg/100ml (0.02%BAC) is recommended as this ensures there is no alcohol in their system. This is the safest level to drive at and is in force with most mainland European countries. 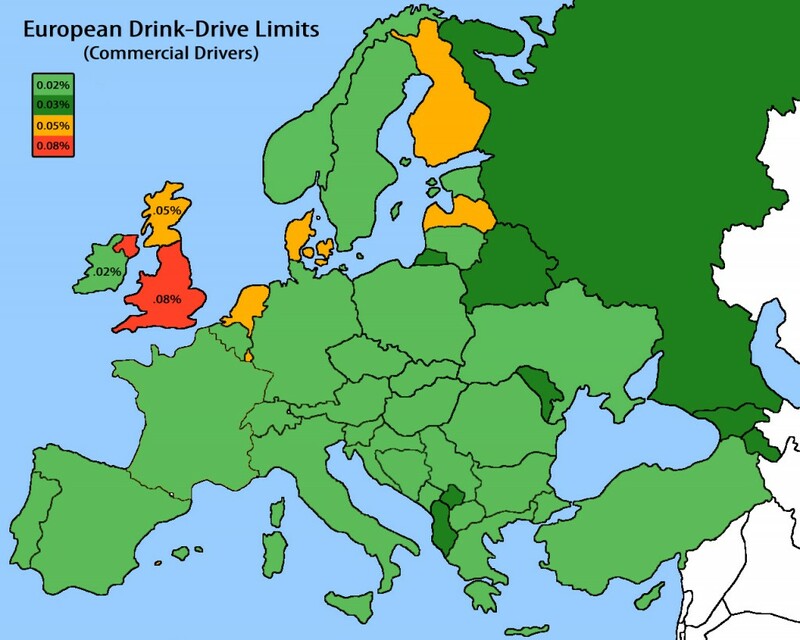 The map below shows just how high the UK limit for commercial drivers is, in comparison to other countries. For advice on company alcohol policies and limits, please call our sales team on 0208 454 7372. We supply breathalysers to plenty of companies from all sectors and would be happy to help you. Alternatively, subscribe to our 10 step guide to drug and alcohol policy here.